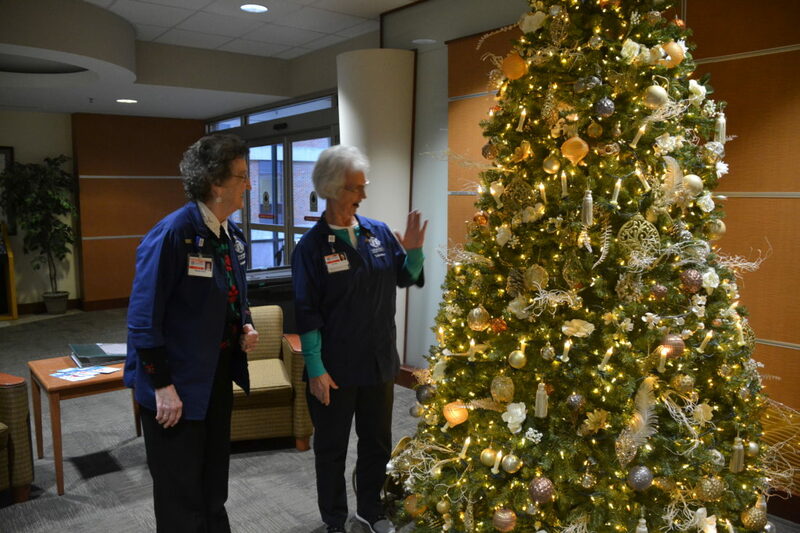 MICHAEL KELLY The Marietta Times Marietta Memorial Hospital volunteers Herma Eddy, left, and Pat Love stand by the Love Lights tree by the information desk at the hospital Wednesday. The tree lights represent donations that assist Memorial's hospice and its heart program. The two volunteers work at the information desk. "It is a pretty tree this year," Love said. When thinking of giving during the holidays, many Marietta residents think of supporting a cause that helped loved ones. One of those causes is the Memorial Health Foundation, which at this time of the year encourages people to buy lights, candles or ornaments on the Love Lights tree at Marietta Memorial Hospital. Daneka Hedges, executive director for the foundation, said contributions to the Love Lights program support the hospice program and, more recently, the hospital’s heart care program. Hedges said the Love Lights project started in 1991 and since then has raised more than $587,000 from 13,000 donors for the hospice program. “We’ve added the heart care program recently because of the growing need in the Mid-Ohio Valley,” she said. The funds for the heart care program help provide heart patients with home equipment such as heart monitors and other things that help patients cope with the demands of recovery or disease, she said. The funds for hospice go toward comfort care and medication, she said. Suggested donations are $10 for a symbolic white light on the tree, $20 for a candle and $100 for a collectible ornament, she said. “Our theme this year is a snowman,” she said. Karen Fenton, a retired nurse in Williamstown, said she contributes every year. The Love Lights gift is important, she said. Fenton said she worked at Memorial from the time she graduated from the University of Cincinnati and still volunteers there. “The lights feel very personal, and the money the hospice gets, it’s for a very important purpose,” she said. Janet Chase of Marietta is a regular contributor to the program, with many friends and family members to remember and honor. “When it first came out, it was an easy decision to remember my parents, who had both just passed away,” she said. Since then, she has memorialized many others, including two aunts and an uncle “who were like grandparents,” her partner’s parents, and others who have been friends or role models, she said. Tom Hockenbrocht, proprietor of Gold Line Jewelers on Front Street, said he has a personal connection to Memorial’s health care. His wife Susan was diagnosed with pancreatic cancer in 2001 but lived for another three years thanks in part to treatment she received at Memorial’s Strecker Cancer Center, he said. Hockenbrocht remembers September 2004, when a month after Susan died, his store flooded from the Hurricane Ivan system that drenched the Mid-Ohio Valley. He was sent to Indianapolis, Ind., for what then was a new form of treatment that has since become the standard response to the aggressive disease. Hockenbrocht said Love Lights is just one of many donations he makes every year, one that he makes in memory of his wife. “The hospice, I never met anyone there who wasn’t a very giving person, they are there because they care about people in this community, they understand what their purpose is, to make things go as smoothly as they can at the end of life,” he said. Hockenbrocht said he serves on the board of the Memorial Health Foundation as another way of giving. Hedges said the tree will remain up until early January. Anyone who would like to contribute to Love Lights can do so online at mhsystem.org/give or contact the foundation at 740- 374-4913 or foundation@mhsystem.org. Brochures on the project are available at the hospital. •Contributions to date: $587,000 from 13,000 donors. •Supports: Hospice program and heart care. •Suggested donations: White symbolic lights, $10, candles, $20, collectible ornament, $100. •To contribute: Go to mhsystem.org/give, contact the Memorial Health Foundation at 740-374-4913 or foundation@mhsystem.org, or pick up a brochure at the hospital, fill out the information and mail it in.